The Veni Creator Spiritus is four-part and almost entirely homophonic. The structure is determined by a musical refrain concluding every strophe, of which the material is derived from Diepenbrock’s own Hymnus de Spiritus Sancto. In that piece it can be found for instance in the last line of the first strophe on the text “(Quae) tu creasti pectora” (see mm. 11-15 in RC 69). Another structural element is the repetition of the opening motive (mm. 1-4) at the beginning of strophes 2, 5 and 7. 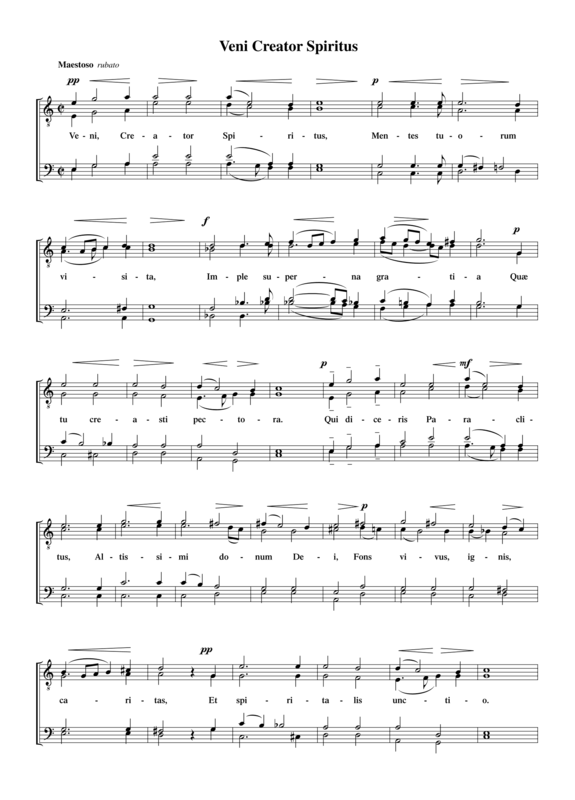 In the first line of the third and sixth strophe the melody of the Gregorian hymn is quoted; a striking feature here is the triplet figure which in this work only appears in this passage. Another remarkable aspect of this composition is the fact that in every strophe the progression or modulation to the key of C major in the final line is realised in a different manner. After that Diepenbrock did not write anything else for the Roman Catholic liturgy. Even the eventual approval for the performance of his mass (RC 27) in August 1916 did not change his mind. On 15 October 1929 the Veni Creator Spiritus was submitted to the Episcopal Committee after all. On 12 February 1930 it was granted the nihil obstat. That same year the Alphons Diepenbrock Foundation published the work through Alsbach.